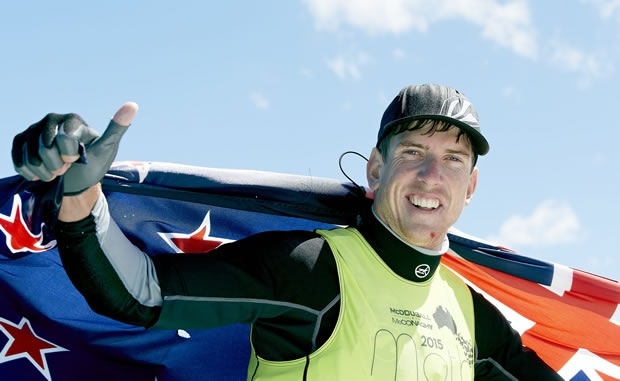 Peter Burling, who turned 24 on 1 January, leaves Sorrento tonight with the McDougall + McConaghy 2015 International Moth World Championship title, the event hosted by the Sorrento Sailing Couta Boat Club (SSCBC) in Victoria. “I‘m stoked,” was all Burling could get out, as he sprayed and was sprayed with champagne after stepping ashore at Sorrento just after 3.15pm local time today. “Holy, that last race, I won it,” Burling said, with a grin from ear to ear. “The boat’s been going really well this week, no problems,” he said. Burling attributed his nine race wins to, “You get on a winning roll and just keep going. Nathan (Outteridge) and I spent a lot of time working on our boats and nothing broke. “All the time I have put in to this campaign paid off,” he said amid cheers and pats on the back from fellow Emirates Team New Zealand team mates, including his 49er crew Blair Tuke, who finished sixth overall. “There are some great guys in this record fleet, I am absolutely stoked to win,” ended Burling who will have little time to celebrate. It is pack up time and then off to the ISAF Sailing World Cup in Miami for an Olympic class 49er event with Tuke. Then it’s back to America’s Cup duties. On the final day, Burling finished sixth in Race 13, the first of the day on the windy and bumpy course on Port Phillip. Initially delayed, racing did get underway on time at 1100am in 15-18 knots on a choppy sea. But competitors were brought ashore after it, while race officials reassessed conditions. 25 knot winds, Burling finished the Worlds in the style he started, with a bullet. Outteridge was second and Rashley third. Josh McKnight was sitting nicely in third until he crashed. Outteridge is disappointed the full series was not completed and that conditions have been extreme. It’s happened at the last three Worlds. “In Hawaii and Hayling Island there was no wind, and here it’s been extreme at both ends,” said the 2012 49er Olympic gold medallist and Artemis Racing America’s Cup skipper who turns 29 at the end of the month. “It’s also disappointing I didn’t have a chance to catch up to Pete. A bit of a shame we’ve been compromised by having such a big Gold fleet. If it was just the top 25 in Gold, it would have been easy to keep sailing today, as the calibre is so high, we would have handled it. “It’s something for organisers to think about in future, because Moth events are getting bigger as the boat gets more popular. It’s hard to manage a fleet of 80 boats on one course. Even from a safety aspect. Josh McKnight had enough in the bank to finish third overall, despite breaking his boom. “I had hoped to challenge Nathan for second place, but there’s nothing wrong with third. Look at it this way, I finished with guys who have America’s Cup contracts either side of me, and I’m a uni student who loves sailing a Moth,” he said. Annalise Murphy (IRE), fourth placegetter in the Laser Radial at the 2012 Olympics, scored the best of the Women’s results with a 14th place in Race 13. But it was not enough to overcome 2011 Women’s Moth world champion and local sailor, Samantha England, who claimed her second Women’s Moth world title. “Andrew and I congratulate Peter Burling on his outstanding win,” co-sponsor Jono Morris said on behalf of McDougall and McConaghy, adding that Burling used all Mach 2 gear – boat, boom, foils, sails. “It’s great to be part of something where we are the major supplier of the boats. It’s cutting edge technology and a platform for the top sailors. It’s where they want to be at the moment,” Morris, joint-managing director of McConaghy, which builds the Mach 2. “It’s interesting to think that before the last America’s Cup, the sailors were getting into cat sailing. Now it’s foiling and the Moths. And it’s not just because they have to, they want to because they love it. “Trying to settle on foil size has been interesting, they are still in development. That’s what Andrew McDougal (the Mach 2 designer) is good at and has spent a lot of time on,” Morris says. “So wherever there’s a big fleet of Mach 2’s, Andrew (or AMac as he is known) will be organising a ‘hospital’ for repairs on an as needs be basis. “It’s been a good thing to do, for sure,” says Morris who added staff member Matt Heynes to McDougall’s Simon Owen-Smith for this event, aware the high numbers and high calibre fleet would mean more casualties. “We’ve got such a good partnership with Andrew, so I’m here to see and get to know the guys sailing the boats. It’s been a very positive and beneficial experience from seeing the boats in action through to the quality of the guys sailing and their camaraderie,” Morris says.